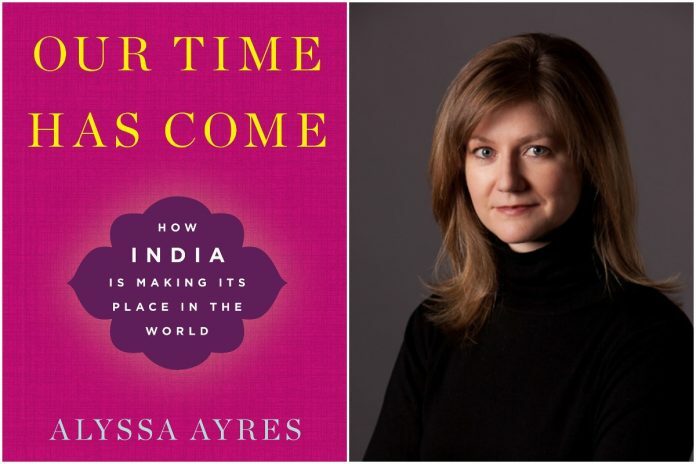 Indians may feel it breaks no new ground, but Alyssa Ayres’s new book highlights to young and educated readers how the world looks at India. As I come to the end of my Harvard sabbatical, I have realised that there is huge appetite within academia, think-tanks, and the broader strategic community in the US to know more about India. The first five decades after independence saw much of the global discourse on India revolve around its social, economic, cultural and spiritual dimensions, with stray offerings on the strategic dimension of India’s role in the world. The last decade or so has seen a proliferation of writings on how India is beginning to punch according to its weight in global affairs, and is emerging as a ‘global power-in-the-making,’ ‘a restrained and responsible power,’ or as some call it, ‘a power of consequence’. It is in this broader landscape that Alyssa Ayres’s sweeping amalgam of applied history, contemporary geopolitical analysis and prescriptive policy guidelines on how to deal with India has come. It is a brilliantly researched, academically robust and yet easy-to-read book on contemporary India. ‘Our Time Has Come: How India is Making its Place in the World’ is a feel good book about the tremendous potential, and energy, in multiple domains that India has demonstrated over the last two decades. This is seen through multiple lenses – that of a young exchange student, a committed researcher, and finally, a key decision maker in the upper echelons of US government. What emerges is a practitioner-scholar’s views on India which focus on a global readership that wants to know more about India. Readers in India may well say that the book does not break any new ground. I would argue that it does in terms of highlighting to young and educated Indian readers how the world looks at India, and that they can be part of an exciting journey in the years ahead. From a policy perspective, the book does well to gently remind the Indian leadership of the fissures and cracks within society; the challenges it is likely to face on the journey to development, and most importantly, the ideological contradictions that still exist and are impeding the rise of India. A recognition and understanding of such influences is clearly emerging in the US, as senior policy makers have realised that pushing India to convert the ‘strategic partnership’ into an ‘alliance’ may never happen. This is not because of the reluctance of the Indian political leadership, but because of the diverse influences on how India sees itself. The author has been circumspect and wary of not being too critical of India’s policy of non-alignment, clearly a result of her extensive interaction with members of India’s diplomatic community. Many within India have been far more critical of this strategy. Economic growth and demographic potential dominate the second part of the book as Ayres leverages her extensive interaction with business leaders to paint a landscape of innovation and growth in the knowledge economy, while highlighting the potential challenges to spurring manufacturing growth, and effectively tapping the huge demographic dividend that India has. Going with the ‘feel good’ flow, Ayres stays clear of delving into the likelihood of the ‘demographic dividend’ turning into a ‘demographic disaster,’ or the lack of innovation in cutting edge technologies or in ‘mastering reverse engineering’ as the Chinese have. No nation has emerged as a great power in recent times without singular focus and concurrent development of capability and intent. Whether it was Great Britain’s ‘colonial dream’, the US seeing itself as the ‘guardian of the liberal world order,’ or the Han Chinese dream of ‘reviving the Middle Kingdom and righting the wrongs of a “Century of Humiliation,’ all of them aligned capability with intent to reach their strategic objectives. Ayres has reflected on the strategic contradictions of India’s internal challenges, and how they seem to coexist with an expansive global posture. The only thing that seems missing is a reflection on how India looks at hard power as a critical tool of statecraft, and how its strategic community reconciles realism, deterrence and coercion with restraint and responsibility. Considering that the US military has exercised more with their Indian counterparts than with any of their formal allies, the absence of any inputs from military strategists or scholars like Admiral Arun Prakash or Gurmeet Kanwal reflects this gap. As a fellow practitioner-scholar, I can well understand the challenges of putting together a right-sized narration. The final section is a measured and doable policy primer for the US, as it looks at sustained alignment with India in an increasingly multi-polar world. Personally, I could not put down the book and will argue that it only adds to the author’s reputation as one of the most perceptive international analysts of contemporary Indian and South Asian geopolitics. Arjun Subramaniam is a recently retired Air Vice Marshal from the IAF and the author of ‘India’s Wars: A Military History 1947-1971. He is currently a Visiting Fellow at Harvard Asia Center and will spend the next six months as a Visiting Fellow at Oxford.